A NEW SOLUTION TO CLEANING WASTEWATER ON SHRIMP FARMS | Chatham-Kent Agriculture Development | We Grow For the World! Ontario shrimp farmers could soon be going green – with algae. New research is using algae to naturally clean recirculating saltwater on shrimp farms. Still in the early development stages, the new, highly efficient process of removing nutrients and carbon dioxide from recirculating saltwater is being tested at the University of Guelph. In-land shrimp farming has grown in Ontario in recent years with the demand for local shrimp in closer proximity to the marketplace. As a result, farmers are looking for new ways to manage nutrient build-up in the production system; conventional methods don’t produce much revenue and saltwater can’t be easily disposed in the environment. 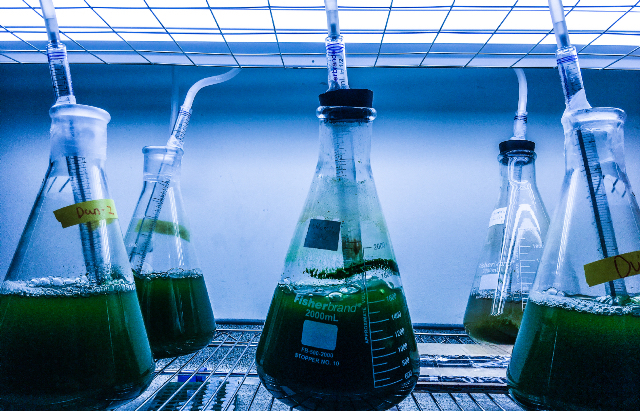 Selecting the right algae strains to remove the excess nutrients is key to achieving clean water and a new marketable product, the harvested algae. “Once grown, the algae have many uses, including biofuels, cosmetics and even applications in biotechnology. Therefore, the large quantities of algae grown on the nutrients supplied by shrimp aquaculture could offer a new revenue source for shrimp farmers, a win-win,” he says. Heyland and his postdoctoral student, Reynald Tremblay, have been working on this project for more than a year. In addition to identifying the most effective algae strains, they have also teamed up with Wael Ahmed from the University of Guelph’s School of Engineering to develop an efficient photo bioreactor in which the algae can be kept separate from the shrimp water, while at the same time experiencing optimal growth conditions. The new system circulates production water through a photo bioreactor, a device that holds the selected algae strains and allows the algae to feed on the nutrients and grow. Over time, algae can be harvested and processed for downstream applications, creating new marketing opportunities and revenue sources for aquatic farmers. Heyland’s research, selected algae strains and the development of the reactor could be expanded to naturally treat wastewater in other industries, like municipal wastewater. “This project has a lot of environmental stewardship and water quality applications. The principles are basic: select the best algae to remove the excess nutrients and create an environment to allow the organisms to naturally clean water,” he says. The project research and initial reactor prototype were developed with funding support from the OMAFRA-University of Guelph’s Gryphon’s LAAIR (Leading to Accelerated Adoption of Innovative Research) program. The Gryphon’s LAAIR is funded through Growing Forward 2, a federal-provincial-territorial initiative.